There is nothing more important than the ability to communicate effectively. Unfortunately, many people struggle unnecessarily with the fear and frustration about public speaking. 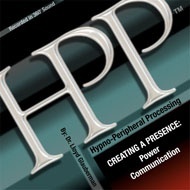 This CD program employs Dr. Lloyd Glauberman�s revolutionary HPP method to build confidence and alleviate anxiety associated with speaking in groups. In addition, it activates your intuitive conversational and interpersonal skills, allowing you to be more comfortable, confident and assertive in every day situations. You will find yourself communicating your ideas easily and clearly. Creating a Presence will allow you a new freedom to communicate your point of view and accomplish your goals. Specific skills it teaches include: preparing for a speaking event, generating positive beliefs about your capabilities, becoming more assertive, influencing others, and building self-esteem. Whether you are can barely stand the thought of speaking up in a group, or are looking for that extra edge to ace your next business presentation, Creating a Presence can take you to the next level.